The woman with the tray is about to go ballistic. She’s been slaving over a hot stove all day, and the men are glued to the radio because they are listening to the Doctor Anonymous Show. And who can blame them? Doctor A. is very entertaining. Click here to learn more about his radio show. Tune in this week because Dr. A and I will be talking about the next edition of Grand Rounds. I'm sure that we will discuss other things, too, because I never know when to stop talking. Just ask my husband. The show is airing on October 4th at 10 P.M. EST. It’s a good thing that the show is airing after supper because the lady of the house will kill these guys if they blow off another home cooked meal. I can imagine the woman telling them she has been slaving over a hot stove! As an antique radio buff, I recognize the photo as a typical ad for the big console radios that the family gathered around in those days. Or was is an ad for a particular beer brand? 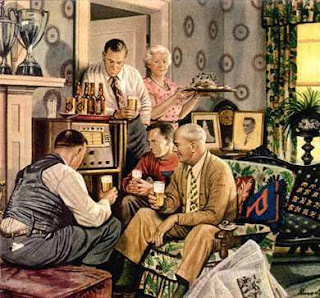 The family radio and beer. Those were the days. MJ, I listened to Dr. A's first radio show yesterday. It was great to hear your voice when you called in to chat. I hope that you will blog about your daughter's impending wedding. Sounds like a hoot!